It was an isolated spot and a light breeze ruffled the Wabbit's fur. "I brought them," said Marshall Duetta Spyder, "just as you requested." The Wabbit looked critically at the assembled enemies. "Why did you come here?" he yelled. "To be in your museum," said a Yellow Gnamskull. The Wabbit smiled secretly to himself and glanced back at Duetta. "What is the agreed union per diem for enemy appearances?" "€125.50 plus duly authenticated expenses," answered Duetta. "Let's round that up," said the Wabbit. "€126." 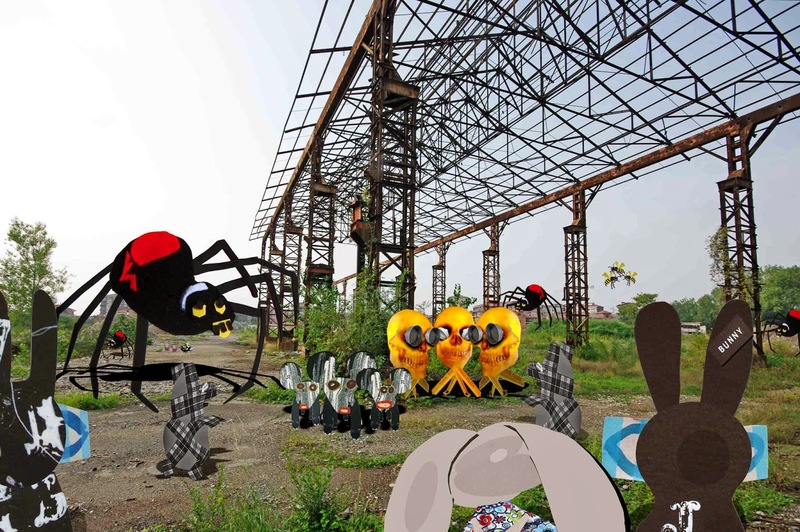 The Wabbit's enemies hadn't expected to be paid so they all stared at Wabsworth until he made an official note. Two MacDrabs were so delighted they ran to each other and hugged and danced. "Attention please!" called the Wabbit. "Unofficial enemies are threatening our mutual hostility." "Get them!" shouted some enemies at the back. "What are their names?" shouted another. "They're called Dumpsters," said the Wabbit. "They are both formidable and messy." "What is their weak point?" buzzed the Wasps. "Indiscriminate appetite," replied Lapinette. The Wasps snickered. Then they pushed their heads together in a planning buzz and sang. "We're gonna chase these crazy Dumpsters out of town." "Gnamskulls," called the Wabbit. "You are in the best position to raid the Dumpsters." The Gnamskulls preeened. "So you're going Dumpster Diving," shouted the Wabbit. "Accursed be their lids," yelled the Gnamskulls. "You're on bonus," said Wabsworth.